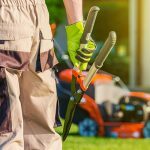 When it comes to hiring a commercial Omaha landscape professional, there are a few things Omaha business owners should consider before ever inviting a crew on your property. While it’s true that there are many professional landscape services listed in the Yellow Pages or online, it’s important to realize that not all services are created equal when it comes to Commercial grounds care and maintenance. While some may provide seasonal cleanup and periodic snow removal, they may not provide needed landscape design or construction services. Does your business need sprinkler or irrigation service and expertise? Exterior lighting installation or maintenance? The needs of your business will ultimately determine which service is best for you. Above & Beyond CGM has years of experience and dedicated lawn care professionals in all aspects of commercial landscape services, offering one-stop service for our commercial customers. Never invite a commercial landscape company onto your business property without first looking at what existing customers have to say. While many will post positive testimonials on their website (and those are valuable), you’ll also want to look a little further into those reviews found online. Check out Google reviews and Yelp. Explore Angie’s List or Houzz and see what real customers have to say about the services they received. The commercial landscape company who works for you should have nothing to hide. Above & Beyond CGM is proud of every one of our reviews, and we are happy to share them openly with you. Many businesses that hire for commercial services expect to receive exactly what they pay for and enjoy a breath of new ideas on how to make their business look the best on the block. Sometimes business exteriors all begin to look alike with the same types of plants, shrubs and design features of all the other businesses on the route. For companies that require a little more customization and who desire to stand out in a crowded marketplace, an exterior landscape is one way to do this. Above & Beyond CGM specializes in custom Omaha landscape design, construction, and ongoing maintenance. If you’re looking for a company to provide commercial landscape services, which is accessible, responsive and reliable, give Above & Beyond CGM a call at (402) 934-8866. We take pride in offering businesses a great working relationship, open dialog, and ongoing customer service for complete satisfaction.